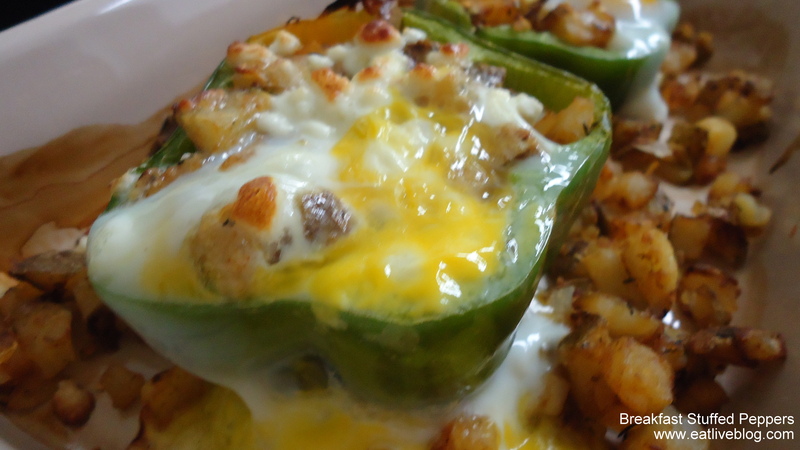 Breakfast Stuffed Peppers – Perfect for Entertaining! A couple of weeks ago, Jen (the Beantown Baker) published this fabulous recipe for Baked Egg in a Tomato. If you take a look at it, you will instantly know why I was inspired! That same week, I attended the Boston Brunchers event at OM Restaurant, where the spicy little potatoes stole the hearts of everyone who brunched that day. Naturally, I found myself craving both of these delicious morning treats. Then came Irene. Being from Florida, I am not one to panic about a hurricane hitting us in Boston…so I delayed preparations. Come storm day, that left us in the house with only 2 eggs, and craving a delicious full breakfast. 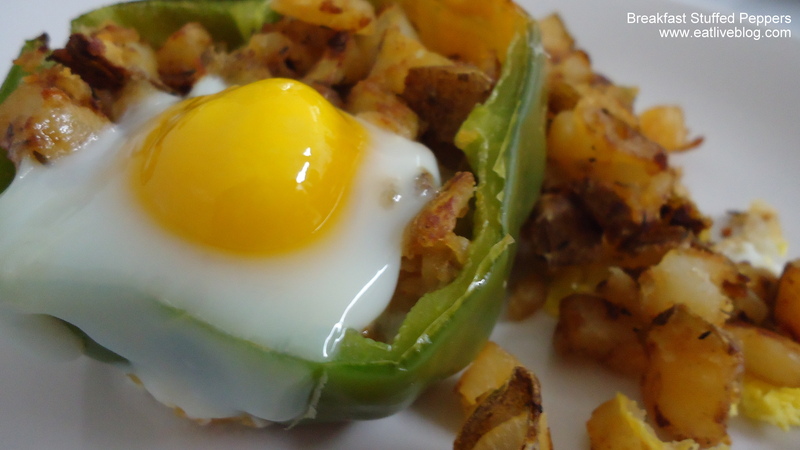 Luckily, Jen’s tomato baskets came to mind, and breakfast stuffed peppers were born! One yolk broke, but it was still delicious! I enjoyed every bite of this meal, and plan to make it again….and again! One tip, this would be a perfect entree to make if you are hosting a breakfast and need to serve multiple people at once. It is so hard to get eggs for a group ready all at once. With this meal, you can pop all of your peppers in the oven at once, and have runny yolk deliciousness ready for a group! Place bell peppers opening down in a baking dish. Place in oven while it preheats. When oven hits 425 degrees, remove peppers from oven and turn them upright. Set aside. In a skillet, heat your olive oil over medium high heat. Meanwhile, place the potatoes in a bowl and toss with seasonings. 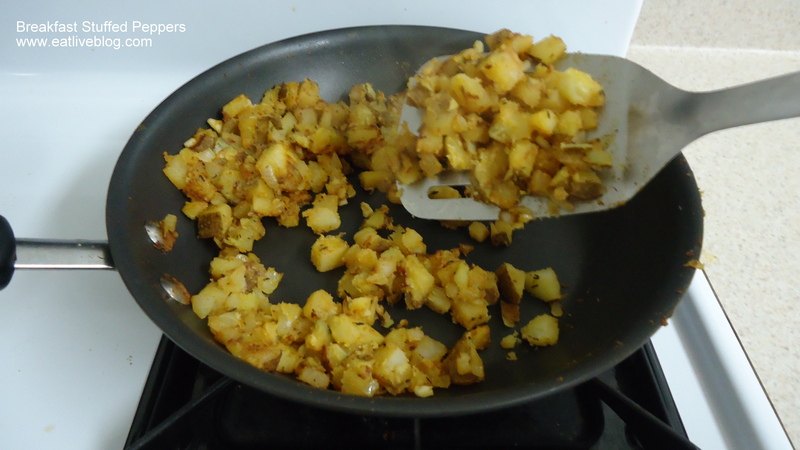 When oil is hot, place the potatoes in the skillet in a single layer. Let cook over medium heat for 3 minutes, undisturbed. Flip potatoes, flatten into a single layer again. Allow to cook until water is gone. Stir potatoes and continue to cook until potatoes are cooked through and browned (about 5 more minutes). Fill the peppers with potatoes, placing the excess potatoes in the bottom of the baking dish. Make a whole in the middle of the potatoes. Crack one egg into a bowl. Pour the egg into the indenture in the potatoes. Repeat with the second egg and second pepper. Place peppers in the oven for approximately 10 minutes, or until the eggs are cooked to your liking. Place each pepper on a plate with xtra potatoes. 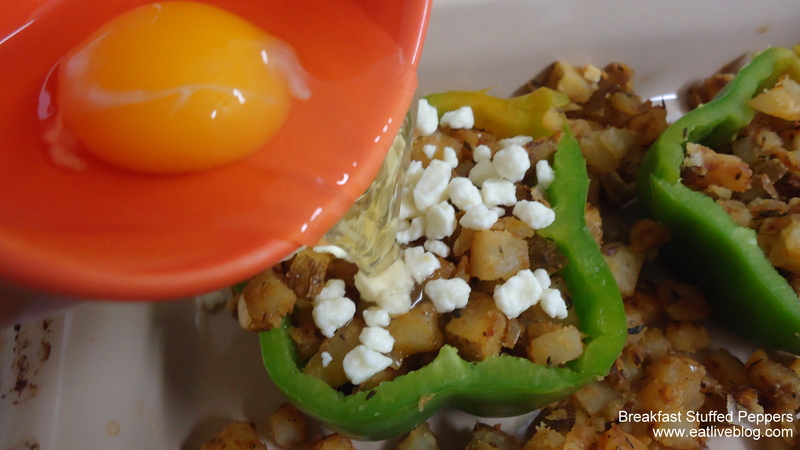 This entry was posted in Recipes and tagged breakfast, Brunch, eggs, homefries, potato, recipe, stuffed peppers by reneeh. Bookmark the permalink. I was waiting for you to blog about this! I love that we were both inspired by Jen’s blog and Hurricane Irene to make such hearty breakfasts! MMM these look great Renee! Pinned! Such a creative idea! I’m so used to peppers stuffed with meat and rice. I’ve been seeing so many interesting stuffed pepper recipes lately. oooh after seeing tomatoes with eggs I started thinking about something like this. Looks DELISH! Love this idea. I have two red peppers on the counter I was going to go a more traditional route with but I love stuff like this. Very creative, and I’ll bet delicious! What a great recipe and idea! Looks amazing, shall have to try it! Yummm! I am still thinking about that Om brunch and also want to create Om-inspired dishes at home! Ooh… this looks delicious! Thanks so much for stopping by my blog and saying hi, Renee. I always love talking with other Boston bloggers! These look amazing; what a great idea. I think I’ll make them tomorrow morning. Yummy!